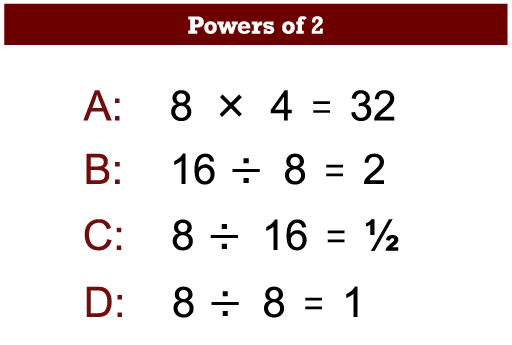 Recall and use the properties of exponents to generate equivalent numeric expressions. Identify the appropriate property to use and apply it correctly. Check the numerical value of an expression involving exponents without using a calculator. After a whole-class introduction, students work in small groups on a collaborative discussion task, grouping cards based on numerical equivalence. Throughout their work, students justify and explain their thinking and reasoning. Students review their work by comparing their card groupings with their peers’. In a follow-up lesson, students revisit their initial work on the assessment task and work alone on a similar task to the introductory task. Each student will need a mini-whiteboard, pen, and wipe, copies of the assessment tasks Properties of Exponents and Properties of Exponents (Revisited). Each small group of students will need cut-up copies of Card Set: Expressions and Card Set: Single Exponents, a large sheet of poster paper, and a glue stick. 10 minutes before the lesson, a 90-minute lesson (or two shorter ones), and 15 minutes in a follow-up lesson (or for homework). These timings are not exact. Exact timings will depend on the needs of your students. 8.EE: Work with radicals and integer exponents.